This may be incorrect as the ISBN is listed as that of a map of Watton, Swaffham & District. Two detailed maps side by side, one for 1910, the other for 1938, a fascinating opportunity to see how the area developed. Coverage runs from Claremont Park (where the Hilton Hotel is today) northward to Lowther Avenue, and from the coast inland to Devonshire Road. 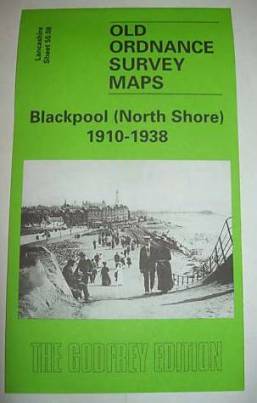 On the earlier map development is still taking place although features include the tramways (still two systems at the time), Gynn Inn and Uncle Tom's Cabin By 1938 features include the Derby Baths, Savoy Hotel, Cliffs Hotel, Boating Pool, and much more housing development. By this time the Bispham area has become part of Blackpool. On the reverse we include a good 1934 street directory, listing the inhabitants for Claremont Road, Cornwall Avenue, Holmfield Road, King Edward Avenue, Queen's Drive, Warbreck Hill Road, Warley Road, Westminster Road.